It’s the slow-motion train wreck you can’t turn away from, courtesy of the bullet train that is Amazon. 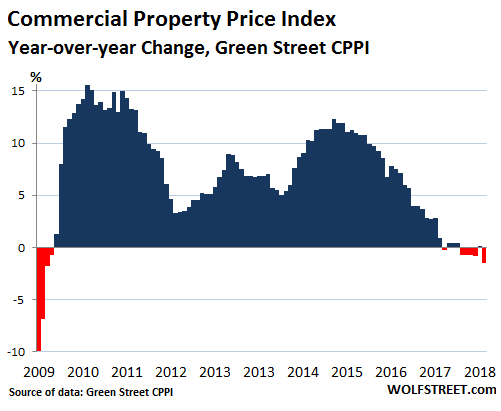 While much of the CPI is hurting, malls property is simply getting obliterated. “The mall.” What was the new American suburban town square in the 1980s, is fast on its way to being an antiquated footnote in a future Wikipedia entry, as people read with disbelief and fascination about how people went to giant, fancified, multi-sectioned warehouses, and then once there, could only buy what whatever goods happened to be on hand that day. "Your stuff wasn't even delivered! You had to go to where the stuff was! And you weren't even sure they'd have anything you wanted!" Commercial real estate loans at banks in the US reached a record of $4.3 trillion. 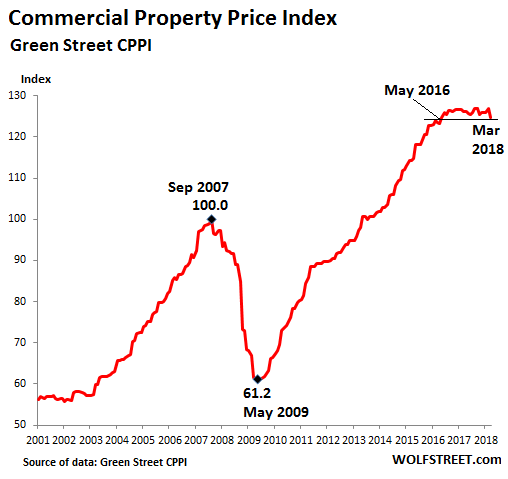 This amount is now 11% higher than it had been during the crazy peak of the prior commercial real estate bubble before it imploded during the Financial Crisis. In CRE, leverage is everything. Banks, particularly smaller regional banks that specialize in it, are on the hook. Fed governors have pointed at CRE as one of the places where “elevated” prices threaten “financial stability” because of leverage and the connection to banks. CRE loans were in part responsible for the near-collapse of the financial system during the Financial Crisis, after CRE prices – the value of the collateral for those loans – turned down. And now, these bubble prices have started to turn down once again.